PINTLE HOOK, CLEVIS, EYE, COMBO-HITCH - Auto Wheel Services, Inc.
• Drawbar eye dimensions - 2-3/8" to 3" up to 1-9/16" diameter section. • Individually boxed (Retail Packaging) with drilling template and capacity decals. Ball Size 1-7/8", 2", & 2-5/16"
Drop forged alloy steel rigid type pintle hook. 2" to 3" I.D. with 1-1/4" to 1-5/8" diameter section. Plate Dimensions 5" x 3.75"
Solid shank, These mounts accept PH5, PH8, PH15, PH20, BH8 or similar pintle hooks. 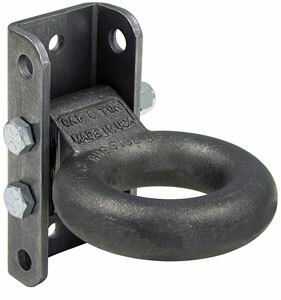 ​Plate Dimensions 5" x 12.50"
These mounts accept PH5, PH8, PH15, PH20, BH8 or similar pintle hooks. PM812 Shank Dimension 2" x 12.25"
PM1012 Shank Dimension 2" x 14.50"
Cast alloy material with one hand coupling mechanism for ease of use. Coupling latch locks into place when securing latch is in the closed (down) position. Finished with black powder coat for durability and corrosion resistance. 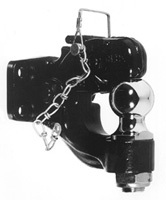 Pintle hooks are individually boxed and include mounting instructions, specifications sheet, and vehicle capacity decal. Reduce capacity by 25% for off road applications and use with swivel type trailer drawbar. Drawbar eye dimensions- 2" to 3" I.D. with 1-1/4" to1-5/8" diameter section. Drawbar eye dimensions- 2-1/2" to 3" I.D. with 1-1/4" to 1-9/16" diameter section. Swivel action provides torsional relief at the coupling. Drawbar Eye Dimensions 3" I.D. with 1-5/8" diameter section. Includes mounting hardware and capacity decal. One-piece forged design for safety & capacity. 3" I.D. eye and 1.62" section drawbar. Heat treated wear surface with 4-hole square mounting base. *90,000 lb capacity for hinged tongue trailers where there is a negligible tongue load (500 lbs. max). ​​One-piece forged design for safety and capacity. 2-1/2" I.D. eye with 1-1/4" x 1-1/2" section draw bar. BDL253 DRAWBAR-LOCK 2-1/2 to 3"
Rugged zinc plated trailer locking device.